• NEW: $40 million pact stipulated that Imus be "controversial"
NEW YORK (CNN) -- Former radio talk show host Don Imus has hired one of the country's top trial lawyers to sue CBS Radio following his dismissal last month for making racial and sexual on-air comments about members of the Rutgers University women's basketball team. Attorney Martin Garbus told CNN Wednesday that he has agreed to represent Imus in a wrongful breach of contract suit against his former employer. A CBS spokesman declined comment. Imus had $40 million remaining on a multiyear contract that began in 2006 and included a clause that CBS wanted him to be "irreverent" and "controversial," according to CNN legal analyst Jeffrey Toobin, who was shown part of the contract. "Company (CBS Radio) acknowledges that Artist's (Imus') services to be rendered hereunder are of a unique, extraordinary, irreverent, intellectual, topical, controversial and personal character and that programs of the same general type and nature containing these components are desired by Company and are consistent with Company rules and policies." Toobin said the legal issues in the Imus case are simple: "Did Imus breach his contract by saying what he did about the Rutgers basketball team?" CBS dismissed Imus on April 12, eight days after he called the Rutgers players "nappy-headed 'hos" on his radio show, "Imus in the Morning." "What stands out in the contract is he is supposed to be controversial and irreverent. That's what his statement about the Rutgers basketball team was," Toobin said. "How is CBS going to argue that what he said was so controversial and so offensive that it isn't what they asked for in the contract?" The contract does provide that CBS Radio may terminate the agreement for "just cause." According to the document, this includes "on-air mention whatsoever by Artist (Imus) of company's officers or directors. Such limitation shall not preclude references to members of station management, so long as such references are not overtly inflammatory or malicious." 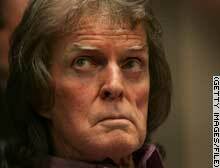 Imus was fired by CBS in April after he made controversial comments about the Rutgers women's basketball team.